Duquesne University received a A.
U.S. News & World Report's ranking of 115 out of 268 of National Universities High School Counselor Rankings was a major contributor to this grade. "Catholic Duquesne University - located atop a hill in central Pittsburgh - works hard to serve a determinedly career-minded (and largely commuter) student population. The health sciences are downright "hard" here, and pre-professional programs in business, pharmacy, physical therapy, and speech pathology are a major draw. Duquesne Profs are accessible but "demanding." What is a typical Duquesne University student like? Describe the type of person that should attend Duquesne University. Not every Duquesne student is the same, there is a wide diversity of students. All though there are many different qualities among students, there is one unifying characteristic. All Duquesne students are hard-working and goal-oriented people. What are the top 3 reasons someone should attend Duquesne University? What was a typical Duquesne University student like in high school? Describe the type of person that should attend Duquesne University. Duquesne's overall high admit rate masks the competitiveness of its top programs. Top-notch programs ranging from music education to pharmaceutical sciences. 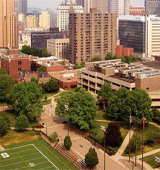 Duquesne University is a private, coeducational university located on a bluff above downtown Pittsburgh, Pennsylvania. Founded in 1878 as a Catholic college by the Congregation of the Holy Spirit, Duquesne is the largest and most comprehensive Catholic university in Pennsylvania, and the only Spiritan institution of higher education in the world. Duquesne is consistently ranked among America's top Catholic universities for its award-winning faculty and a tradition of academic excellence. A coeducational university on a self-contained campus with dramatic views of Pittsburgh's skyline and rivers, the University has students representing nearly every state in the union and 80 nations. Duquesne has a 14:1 student/faculty ratio, and 87 percent of incoming freshman are drawn from the top half of their high school class. Duquesne offers undergraduate and graduate degree programs in natural and environmental sciences, leadership, business, nursing, health sciences, pharmacy, law, education, music, and the liberal arts. In the wake of continuous record-breaking enrollment, Duquesne University has begun construction of a new 12-story, suite-style residence hall for upperclassmen. What are the top 3 things that students do for fun at Duquesne University? Hang out on the Quad, travel into Pittsburgh, join the many clubs and activities available at Duquesne. Campus housing is available for undergraduates. Housing deposit : $500.00. Housing deposit due : May 1. Housing deposit is not refunded if student does not enroll.. Freshman allowed to have car. No pets. 59% of students live on-campus. 17% of male students live in fraternities. 18% of female students live in sororities. Any instructional program in accounting not listed above. A program that prepares individuals, in association with a rehabilitation team or in private practice, to use music in therapeutic relationships to address patients' physical, psychological, cognitive, emotional, and social needs. Includes instruction in music theory and performance, human growth and development, biomedical sciences, abnormal psychology, disabling conditions, patient assessment and diagnosis, treatment plan development and implementation, clinical evaluation, record-keeping, and professional standards and ethics. Dispense drugs prescribed by physicians and other health practitioners and provide information to patients about medications and their use. May advise physicians and other health practitioners on the selection, dosage, interactions, and side effects of medications. 60% of students graduated in the top quarter of their class. The average student pays $25,944 for tuition, fees, and other expenses, after grants and scholarships. Total stated tuition is $28,913, in-state and on-campus, before financial aid. Learn more about financial aid at http://www.duq.edu/financial-aid/. Estimate the net price for you at http://www.duq.edu/admissions-and-aid/tuition/net-price-calculator. 58% of students graduated on time. The typical (median) early career salary of Duquesne University graduates is $43,900, according to Payscale. Duquesne University participates in the NCAA Division I-AA for college athletics. Want more info about Duquesne University? Get free advice from education experts and Noodle community members. What grade point average does a student need to have to get accepted into Duquesne? And what average SAT score would one need? Could anyone give an opinion about the nursing program ? My daughter was accepted at Duquesne and PennState main campus. She is having a very difficult time deciding between the two programs. Any thoughts and observations would be greatly appreciated. After looking at both Duquesne's Nursing site and Penn State's Nursing sites, I see two outstanding schools. I would ask that you and your daughter consider several factors. How often do students make use of the downtown area of Pittsburgh at Duquesne University?